Start by washing the poha,allow to drain.Also cube the potato and soak in water until cooking. Add the onions,salt,turmeric,red chili,sugar and cook till soft. once the potato is cooked gently mix in the poha saute for 2/3 min. Cook covered for 2 min so everything gets well combined and it cooks in the steam. After opening the lid,add in the lemon juice and sesame seeds. Garnish with coconut and coriander leaves and now your done. I serve this in a platter along with sev,white dhokla and sliced mango for a heavy week end breakfast. You can add a mix of other veggies to this along with potato and also add in tomato along with the onion. In my house, we love to have batata poha. 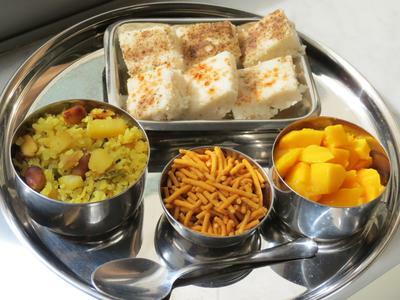 The gujarathi breakfast thali looks very attractive.